Walter is being honored as an American Ambulance Association Star of Life for his commitment to his community and to his fellow first responders. 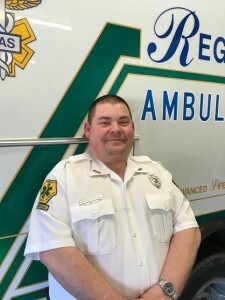 Serving as volunteer Field Chief for the Regional Ambulance Castleton First Responders, he manages the team by coordinating scheduling, completing paperwork, and ordering and maintaining supplies, equipment, and uniforms, in addition to responding to calls. Walter has served on the RAS Castleton First Responders since its creation in 1992. Walter is also an AEMT at Regional Ambulance, serving since 1999.